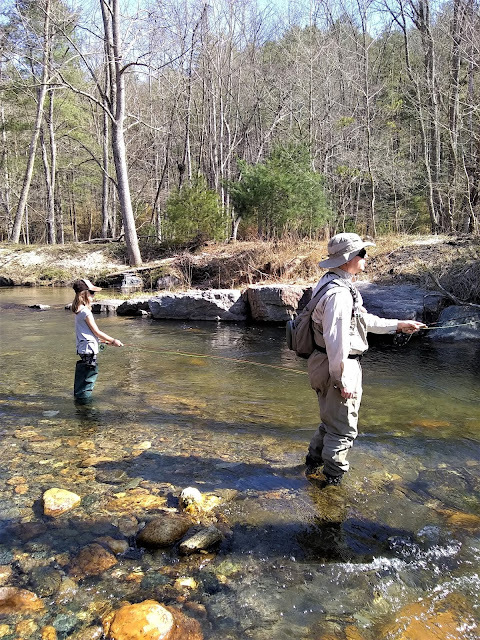 I've been trying to figure out the right timing to fly fish for trout with the kids. I tried last year and it went great until about 20min in my son fell in the river. He wasn't swept away by the current but he did go in face first and got soaked. This time instead of taking both I decided to try just going with my daughter. 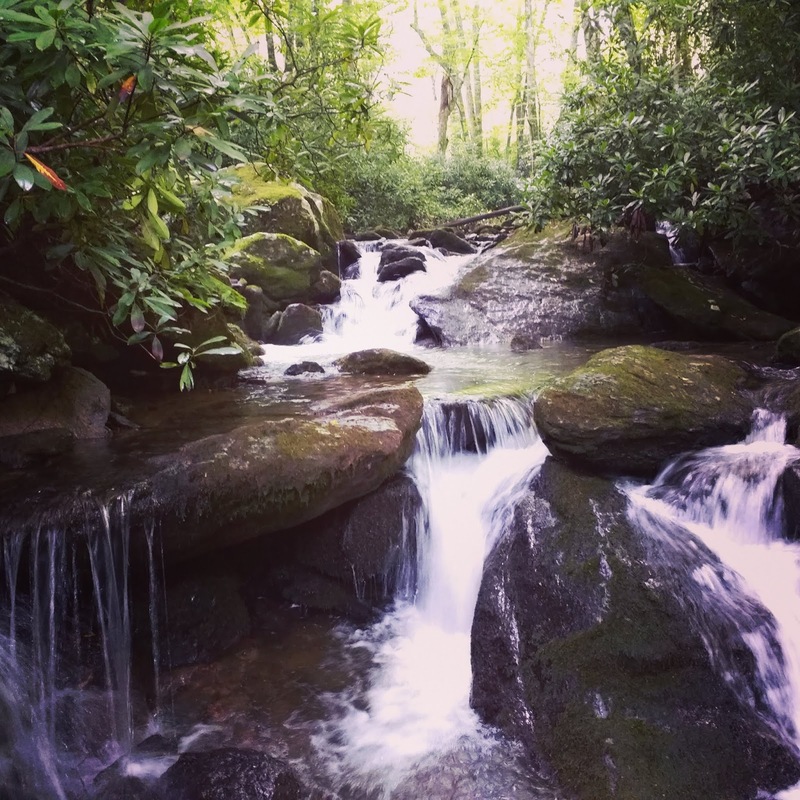 The weather seemed to cooperate and I knew a stream had just been stocked. My mother was able to come along and things were adding up to make a great fishing trip. We got to the river and only one other car was in the parking lot. I rigged up our gear as fast as I could and my mother talked to a gentleman who was recently fishing. He said he didn't think it was stocked at all. My heart kind of sank when I heard that but I was skeptical and decided to check for myself. I looked in a location I knew always had fish and sure enough there were 4 or 5 just hanging in the calm water. Fish were here and I knew a run where they stack up after stocking. 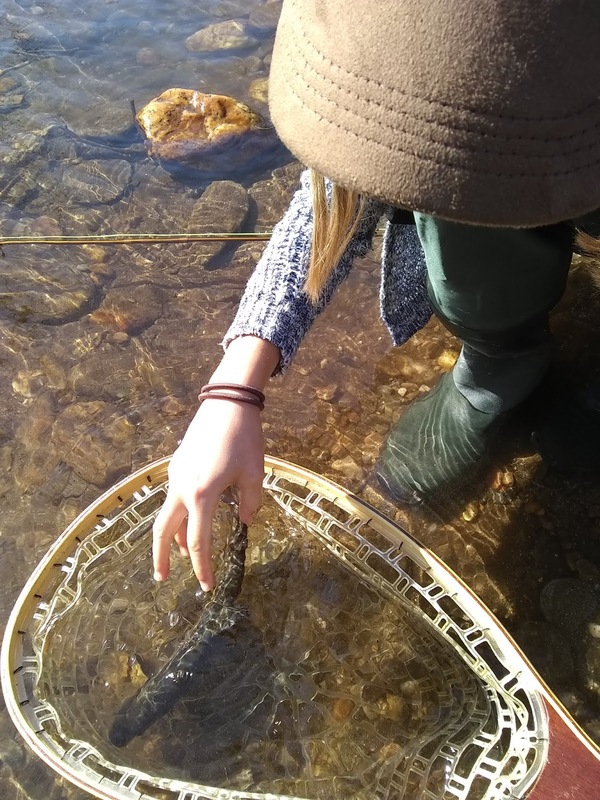 I put my daughter in position and watched her cast upstream. I tried to explain how to watch the drift and keep an eye on the indicator. 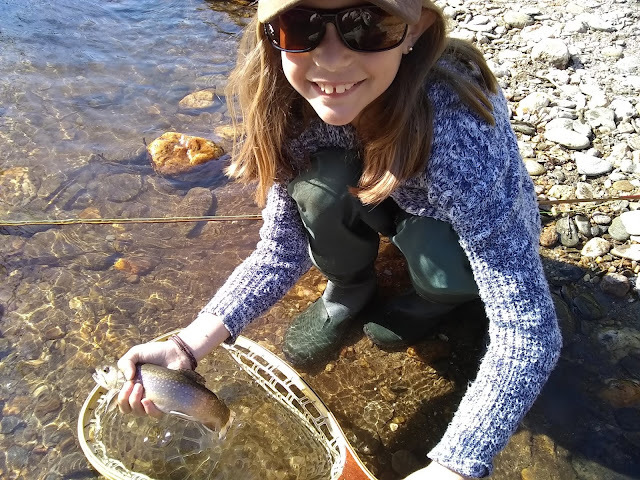 On her third cast the indicator dipped. 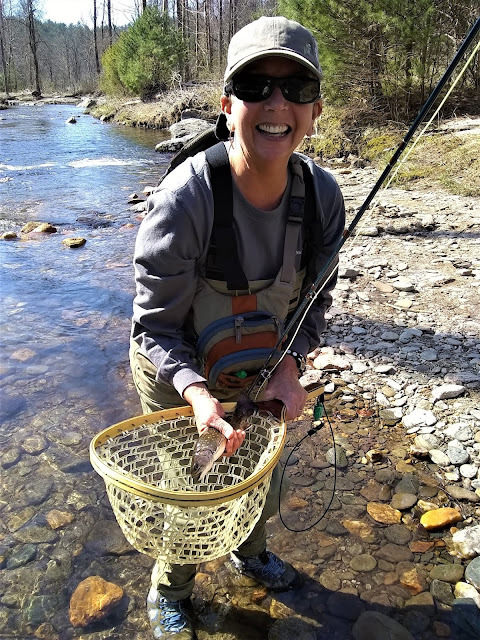 She lifted the rod late and felt the tug of a fish and instantly had that smile you get when you hook a fish. "I felt it fighting!" she said. The next several casts she had several strikes and her timing was just a bit off from setting the hook. I figured this is how it would go most of the day then all of sudden she shrieked "I GOT ONE, I GOT ONE" and I saw a shimmer in the water. Before I could say anything she hauled the fish out of the water and brought it over to the bank. 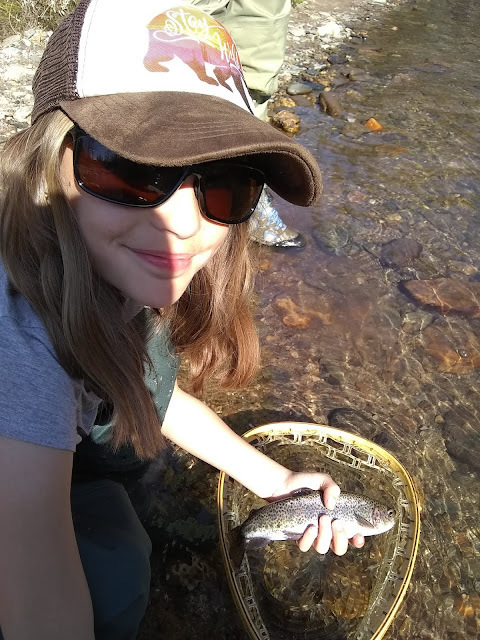 I ran over and put the fish in the net and I told my daughter "try not to slam the fish on the bank but that was awesome!" I was still amazed at how fast she caught a fish. I knew she'd probably catch one but not in the first 10min of fishing. We were both a little giddy. 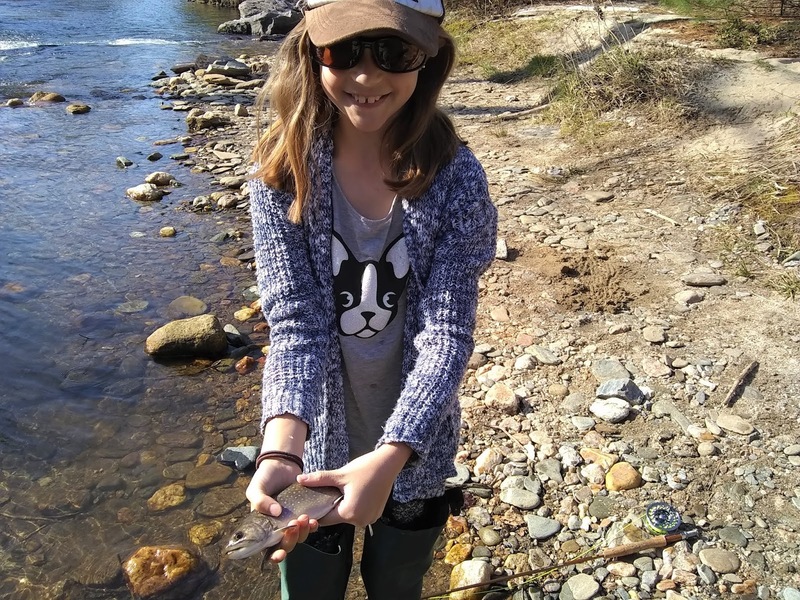 I thought it was beginner's luck but a few casts later she had another fish. Then while I was helping my mother untangle her line I heard behind me "I got another one!" She caught another fish shortly after and then asked if she could take a break. I explained that fishing isn't always like this and some days you don't catch anything. She knew that and wanted to take a break to check out the flowers and do some other projects. 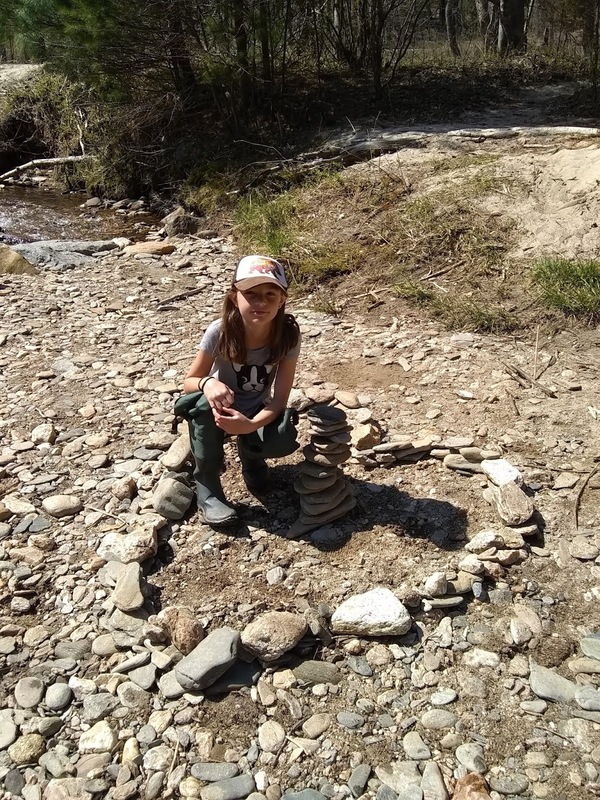 She proceeded to start building something using the river rocks. I thought about talking to her about how those are a home for other animals and some of the consequences of doing that but just left her to her fun. I love that she enjoyed just being outside and it wasn't about how many fish she caught. She learned this a lot faster than I did. It was an amazing day for everyone and the best part is that I could share it with family. We all caught fish and the weather couldn't have cooperated better. I can only hope the future trips we have will be half as successful. God, Country, Family, Rodeo. 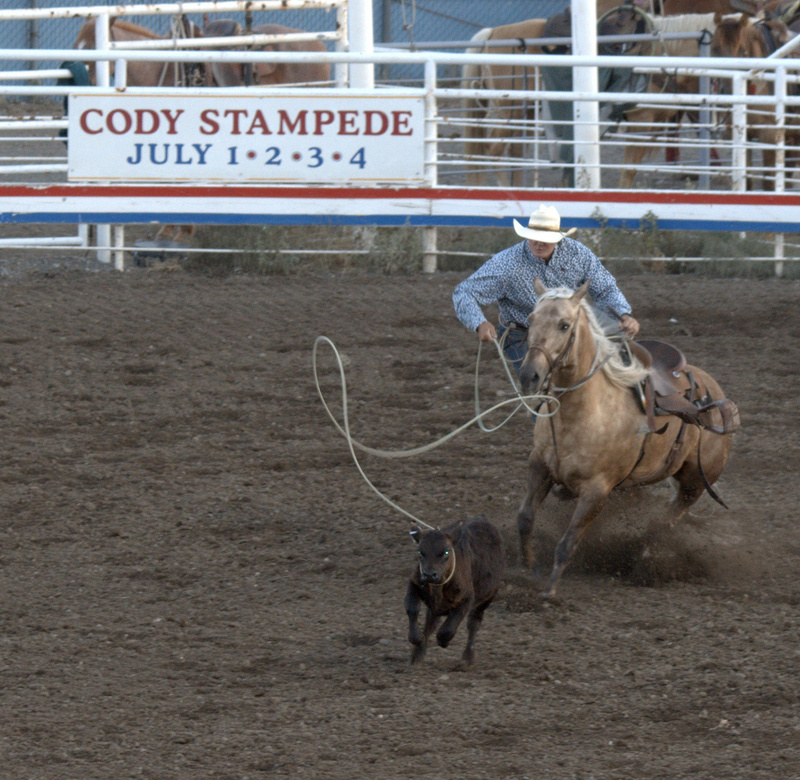 That's Cody Wyoming's motto and after staying in Cody and attending the rodeo I can believe it. It's a must do if you're ever visiting this town. It's fun for the whole family. My kids had an absolute blast and even got in on the action. The rodeo has always fascinated me. It's where man and beast work together or against one another depending on the circumstances. 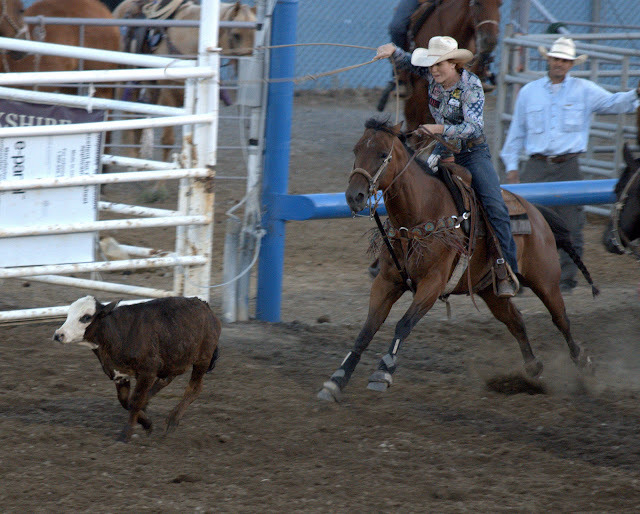 Women look just as tough as the dudes and there's an intensity watching this live that can't really be matched with other events. These people risk their lives on a weekly basis to do the thing they love for hardly any money at all. 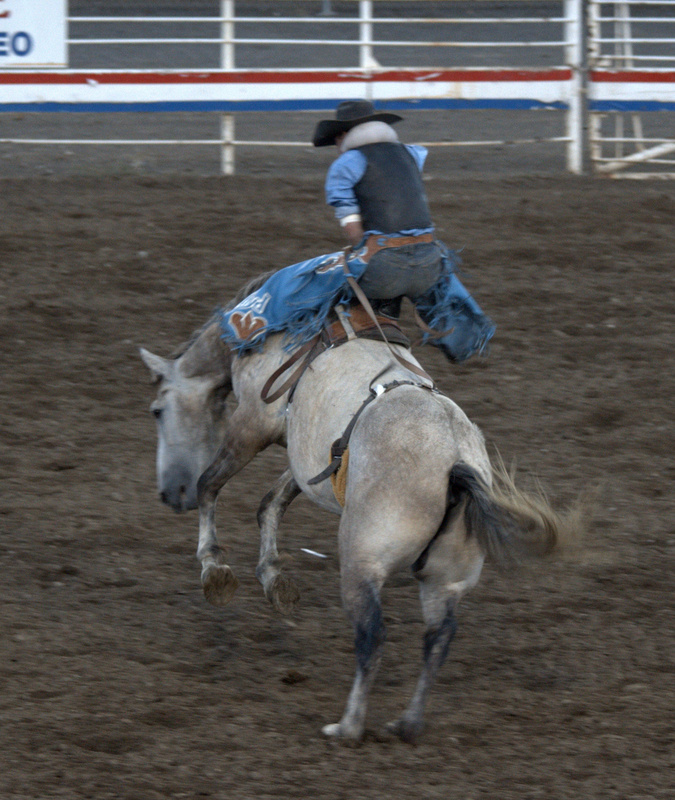 It has to be a hard life living in the rodeo scene but all the people that were participating genuinely loved it. The audience sits on the edge of their seat most of the night and it was fun to see the kids get involved. 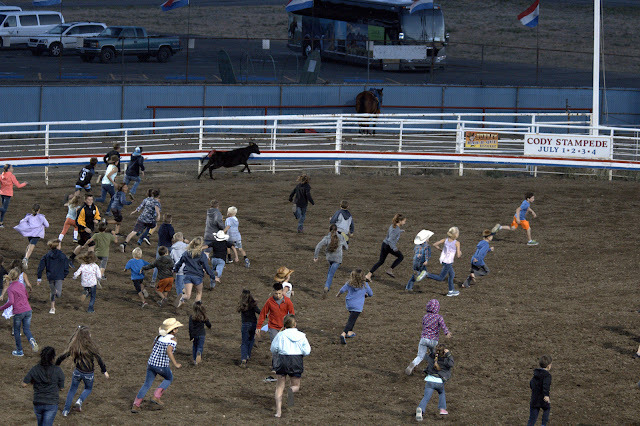 They had an event where the kids tried to get a flag that was tied to a calve's tail. You might think to yourself poor calf but compared to some of these kids the calf probably had an advantage. I was surprised that in a time where people can be so litigious they'd let something like this happen. 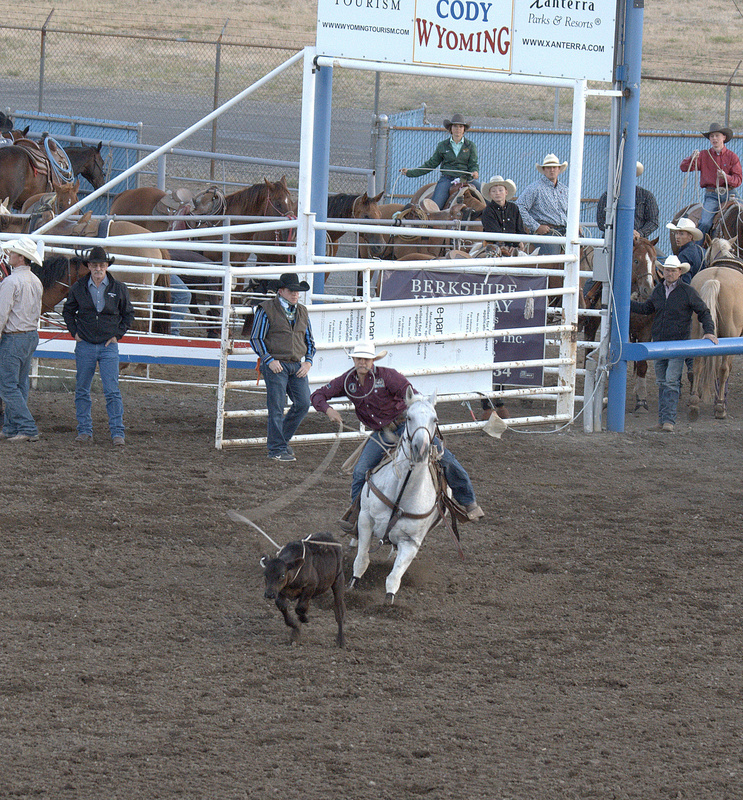 The calves and kids were fine and everyone had a good time. Before Yellowstone I visited my brother in law in Denver. 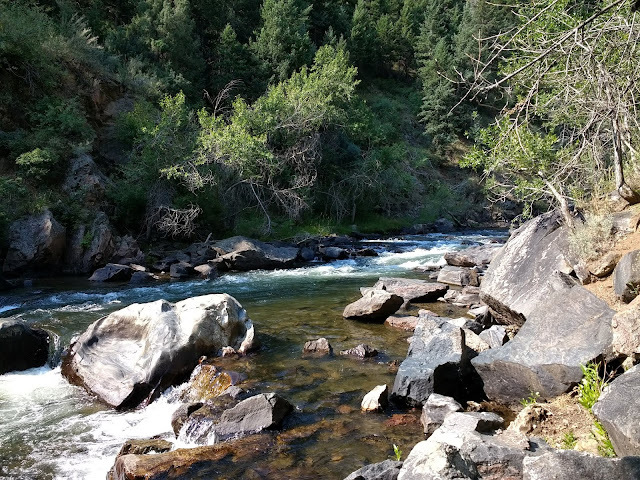 It was my first time there and I found it hard to believe that a decent trout stream would be anywhere near a large metropolitan city. To my amazement there is a ton of trout water with in forty minutes of downtown Denver. You can have it all small stealth stream fishing, trophy monster hunting, and everything in between. I fished a canyon that had some of the most beautiful water I had ever seen. 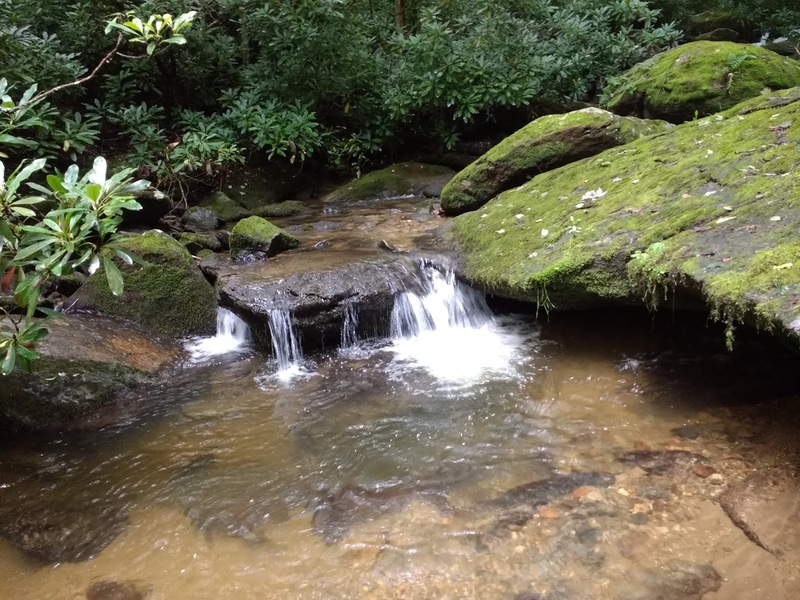 Plunge pools for days, bugs fluttering here, and there with fish jumping in the distance. 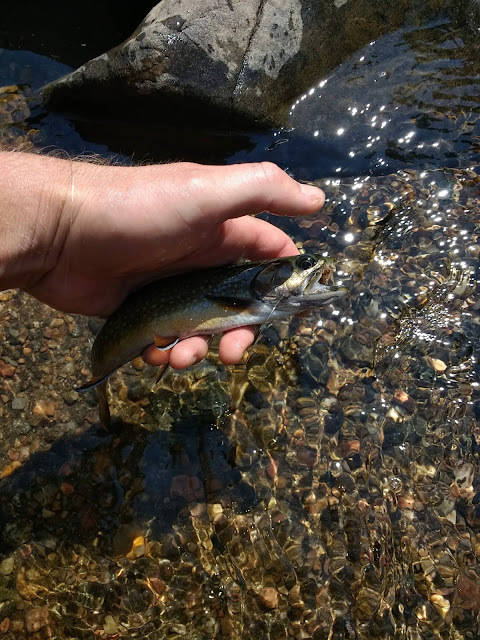 You could literally see the fish in the water at times and I ignorantly expected to catch a fish on my first first few casts. A hundred casts later I realized my expectations may have been a little off. None of the fish even sniffed my fly but there was a brook trout sipping bugs off the surface right at my feet. 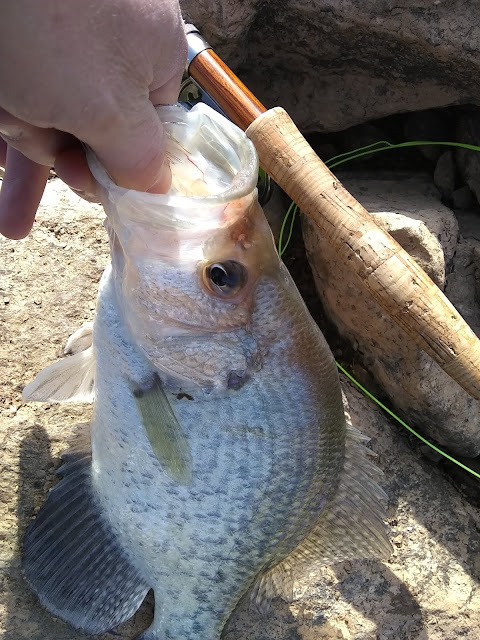 I would leave the fish alone for ten minutes then send another cast its way. 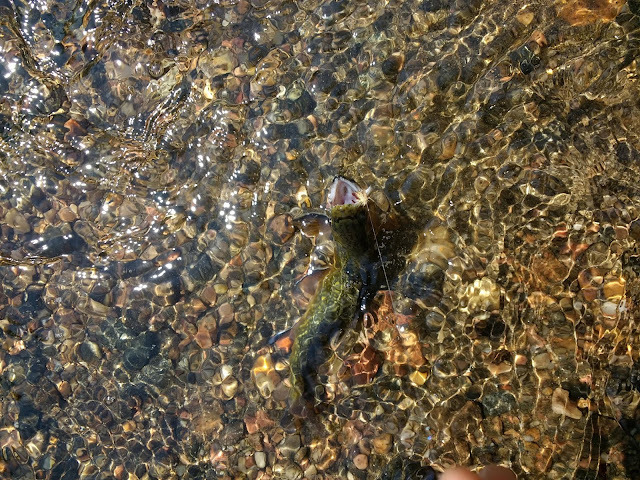 Each attempt I tried a different fly and the fish came up sipped the fly off the surface to only have me pull it out of its mouth. 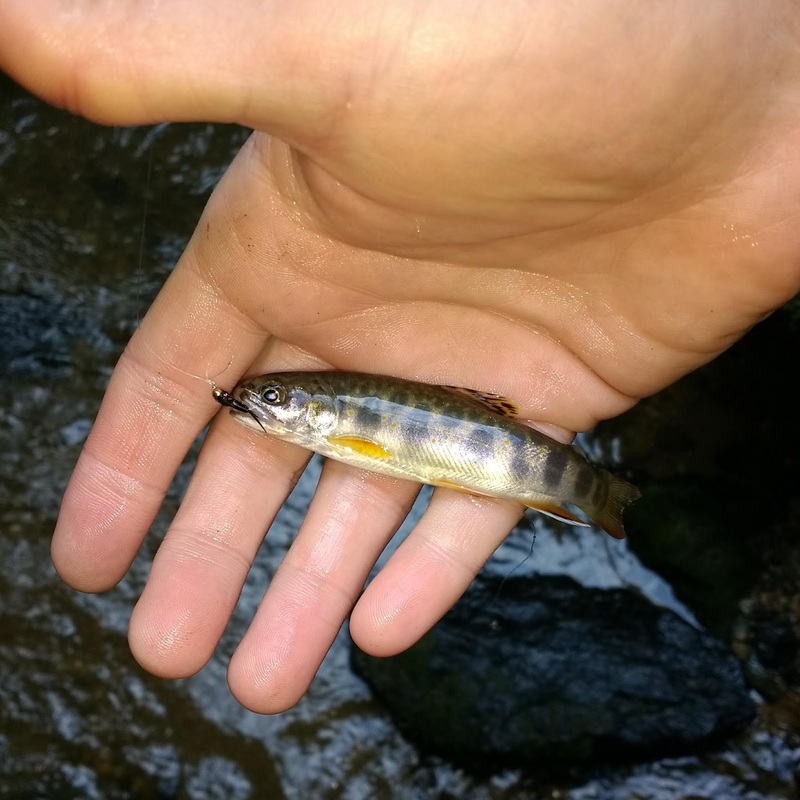 What fish hits a fly multiple times and feeds 3ft from the bank? This fish apparently. Fell for an elk hair caddis. 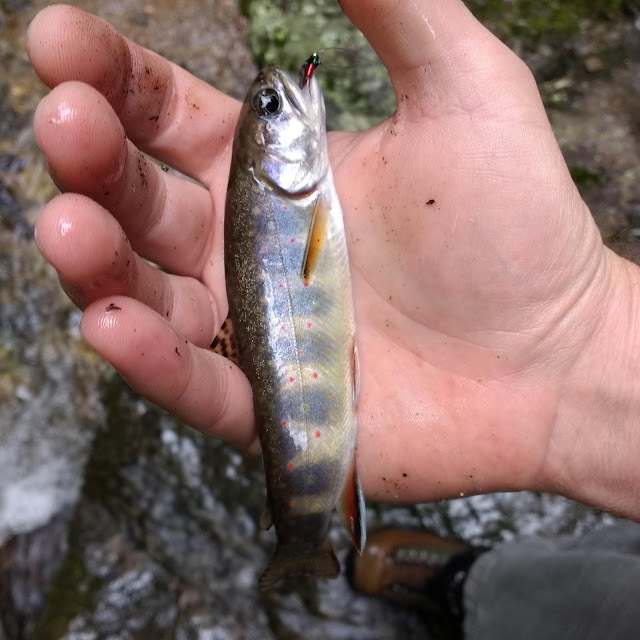 It was a gorgeous fish even if it was the dumbest brook trout in CO. 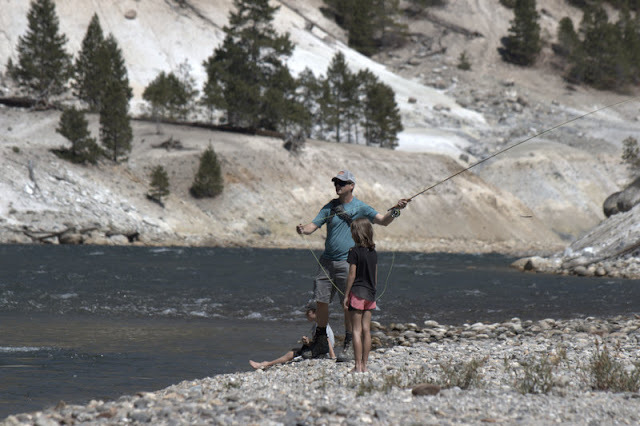 The amount of fishable water in Yellowstone is overwhelming. 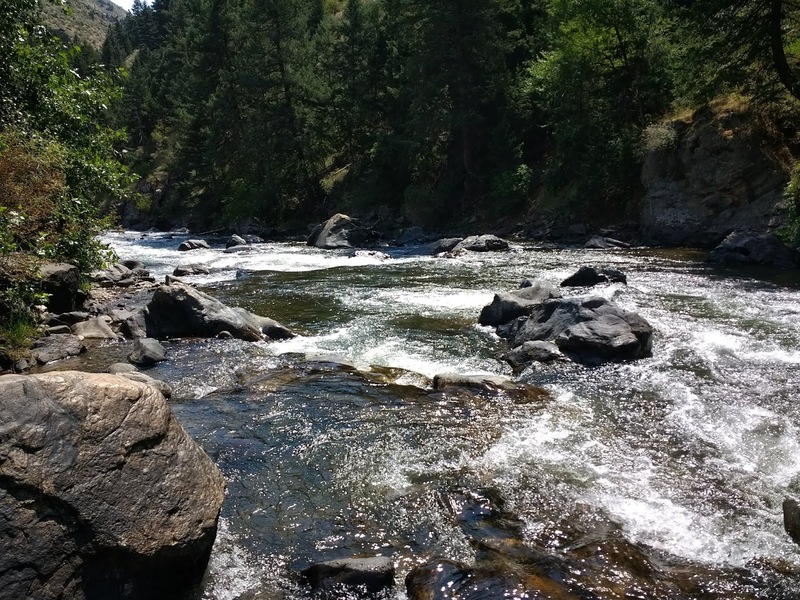 The places I wanted to make sure I fished were the Yellowstone River and the Lamar River. I was able to fish them both but I was unprepared for their conditions. From what I had read the rivers would be lower in July because most of the snow had melted. What I didn't realize is the amount of water that would still be there. I should have figured when I saw Yellowstone Falls. It was running pretty good but I still didn't realize how fast the water was moving until I hiked to the bottom of the canyon. The river was probably the fastest and deepest river I've ever faced. It was a little scary. 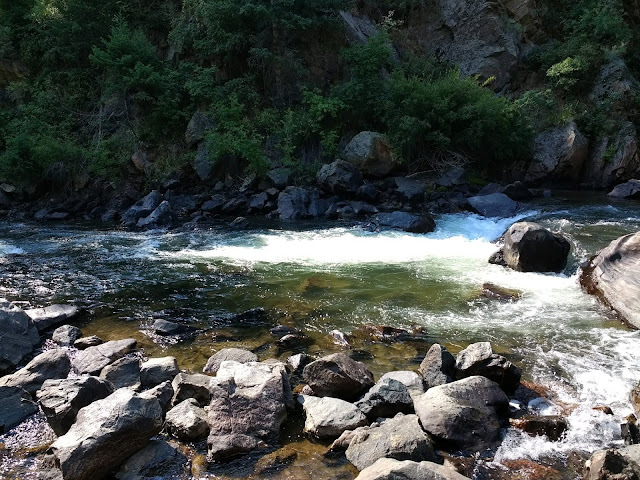 The footing on the sides of the river is smooth cobblestone like rocks and one slip could send you into the river and down the canyon. I'd like to make excuses like it was the time of day, location, or water conditions but the true answer is I was just unprepared. 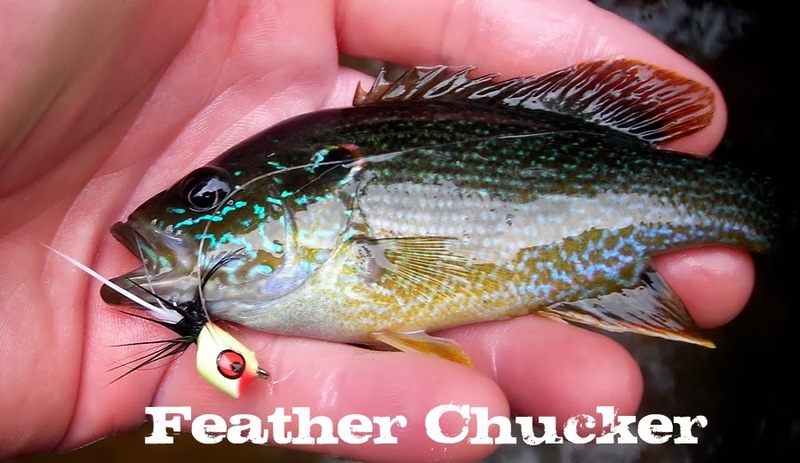 I didn't have any weight to speak of and most of my flies could not get to the proper depth to be effective. Before the hike down I cared so much about the placement of my bear spray that I didn't make sure I put back my tippet. I improvised and used streamers with big coneheads. They did the trick and got fish to move. There were several follows slashes and even one fish coming almost to my feet but I couldn't hook any. I would only get one chance at the fish and then never see them again. It was fun to just see these big fish follow the fly. Fishing in the canyon is surreal. It's so beautiful and just walking 100yds up stream I found a hot spring that wasn't marked at all and leaking hot water into the river. It really shows you how wild and unpredictable this park can be. 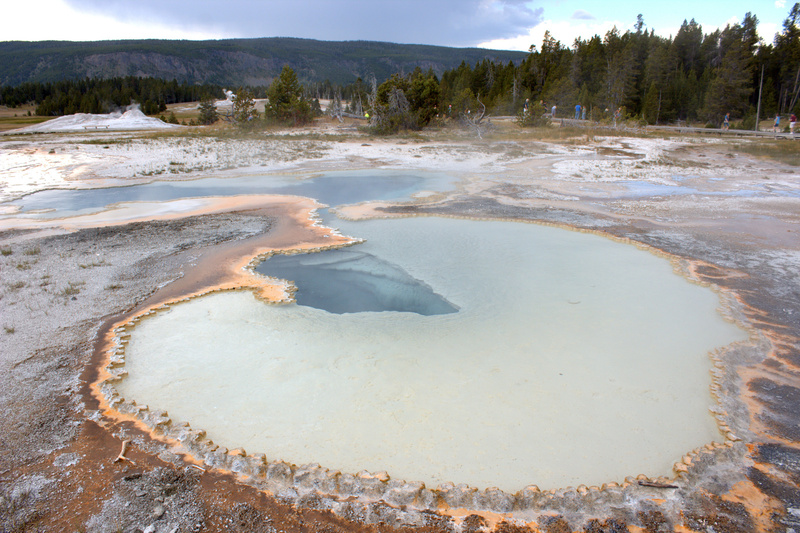 The Southwest part of the park is mostly geysers and hot springs. 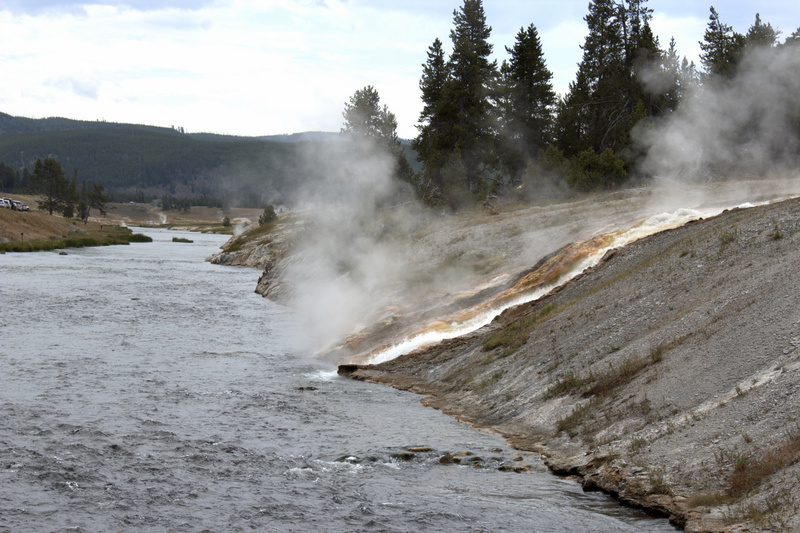 It definitely isn't a you've seen one geyser you've seen them all type of affair. All of them have something that makes them different and interesting. Places like the Grand Prismatic near the Firehole River look fake and seem like something you'd find at a theme park. Once you walk around this place you can truly feel that it is alive. 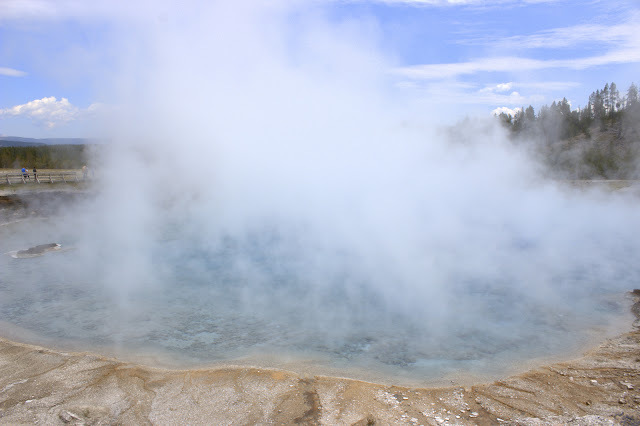 This part of the park hits your senses with the rumbling of springs and geysers, smells of sulfur, feel of hot steam, and the visuals are striking. 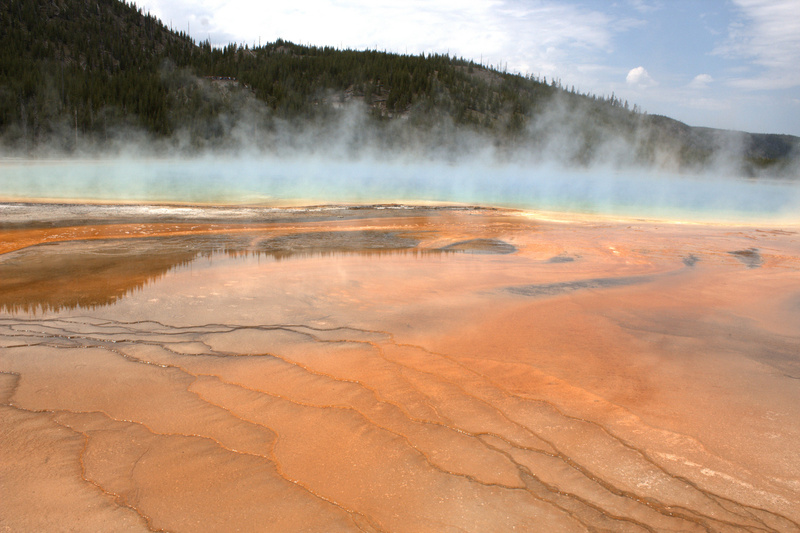 I've seen tons of pictures of the Grand Prismatic hot spring but you have to see it in person to appreciate it. Even with the people falling over themselves to take pictures, ignoring the signs about touching the water, and just making stupid comments it's still a sight to behold. What I found interesting is in all the places where there was geothermal activity you'd see foot prints from bison. I learned from a ranger that the steam that comes from the hot springs is like a repellent for biting flies. 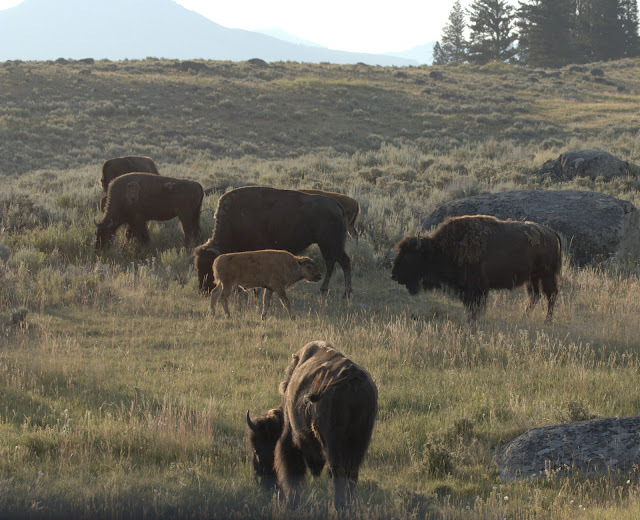 This is why you'll see bison laying next to certain hot springs and geysers. You can see some in the distance here laying next to the mud volcano area. 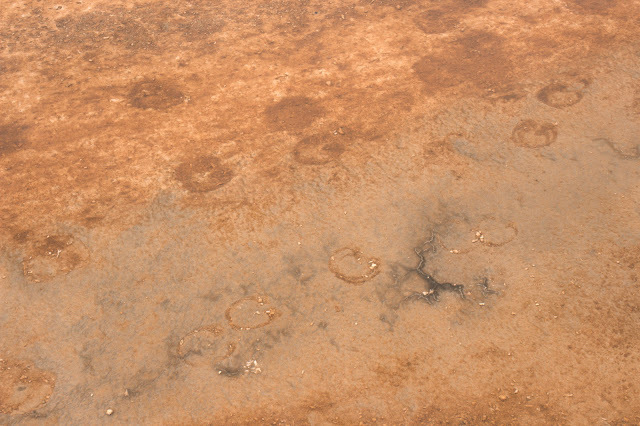 You'll also see footprints where the bison have just trotted right threw a hot spring. I'm not sure if this is out of ignorance or they have a higher tolerance for pain. 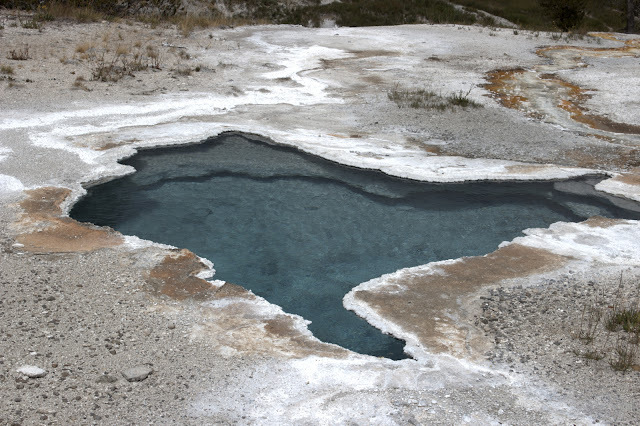 The water in the hot springs is so clear you can make out every feature beneath the surface. 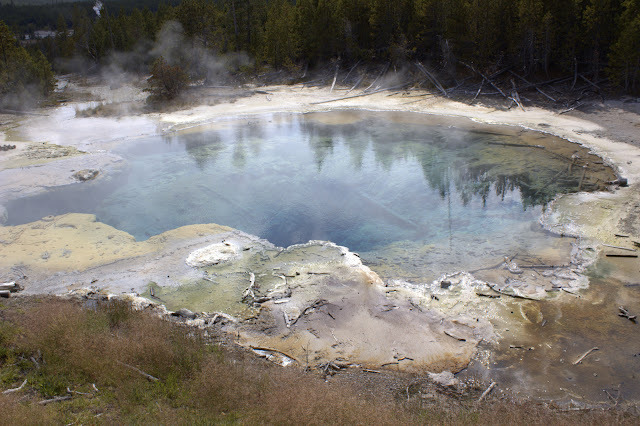 The colors around the springs usually indicate some bacteria living there. 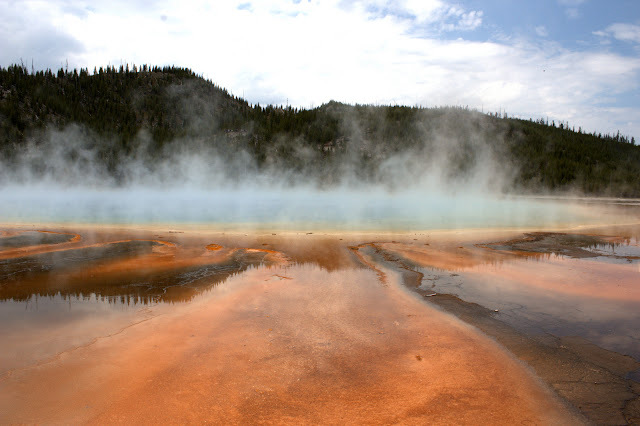 What's interesting is some of the bacteria are so fragile they can only live a certain distance from the hot spring. Any closer or further away and they will not survive. 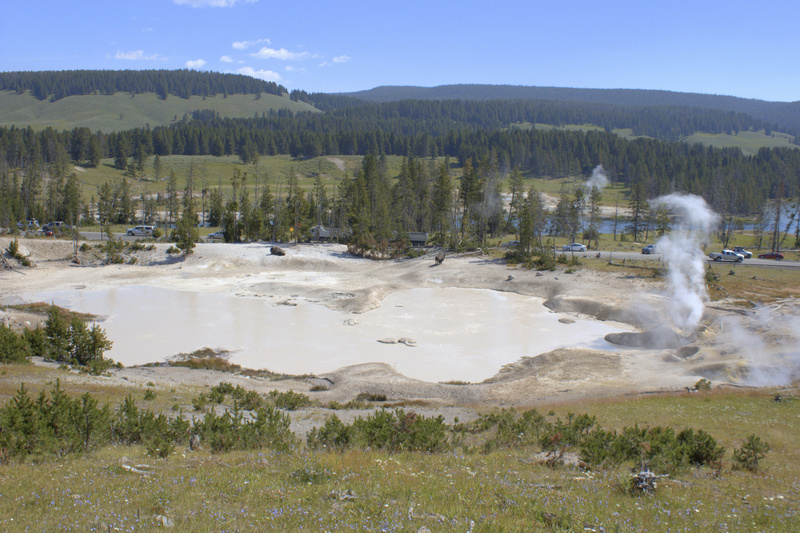 The landscape changes so much with these geysers and springs that the walkway traversing them needs to be moved from time to time. The ranger doing the tour at the Mud Volcano told us the path there had to be moved twice in the last 5 years. The steam in some areas was incredible. I felt like I was walking on another planet at times. Can you imagine being the first people to stumble onto this place? I also wondered how much native americans and early settlers used these springs to keep warm in the winter months. Then there's the thought of how many people were hurt thinking hot springs were cool clear pools. The most famous geyser is Old Faithful but it's actually not the tallest geyser in the park. The reason Old Faithful is so popular is because of its consistency. It goes off every 90min and the park has constructed a huge viewing area in front of it. This area is more like a village than an attraction. There's a Inn, lodge, and visitor's center. All are worth checking out. We ate at the Inn and the food was pretty good. I expected Disneyland prices but they weren't crazy. The visitor center is very cool and has huge windows facing Old Faithful. I'm not sure why you'd watch Old Faithful indoors. It's a lot better to see it outside. 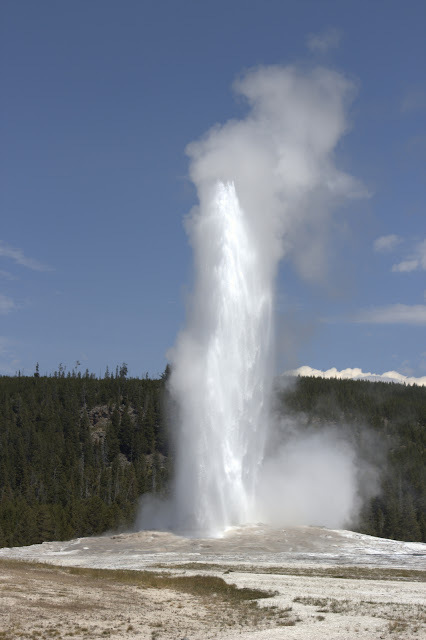 If you can swing it come back and see Old Faithful at night. It's a different experience. Less people and sometimes photographers are there taking pictures and their flash lights up the geyser giving it a different perspective. Heading into Yellowstone around the lake I noticed there really isn't that much of a forest. Most of the park is meadows with brush and shrubs. It's like the high desert in California. 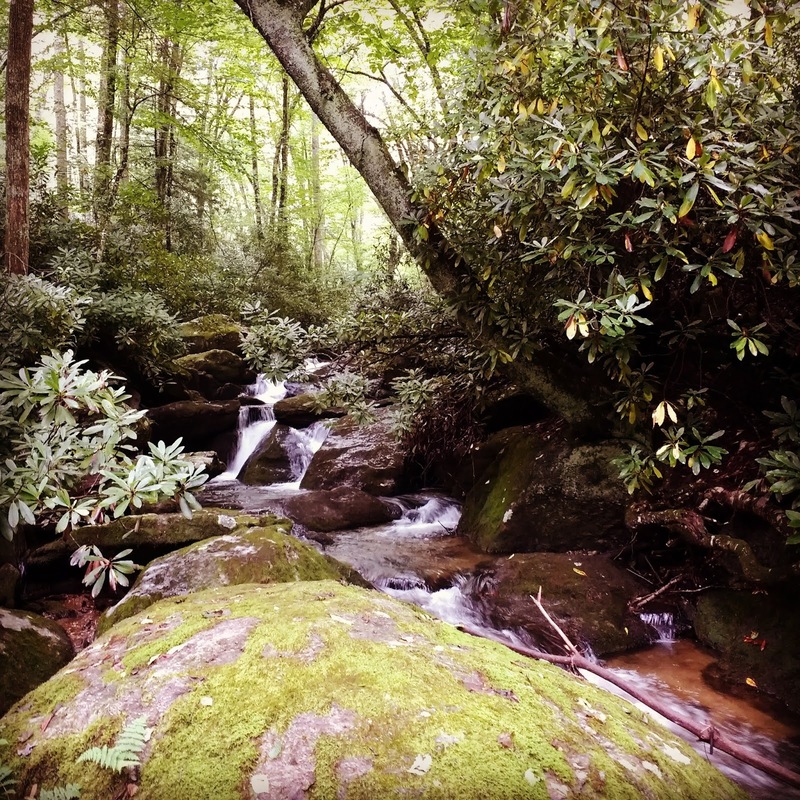 Each section of the park has its own topography and things that make it unique. 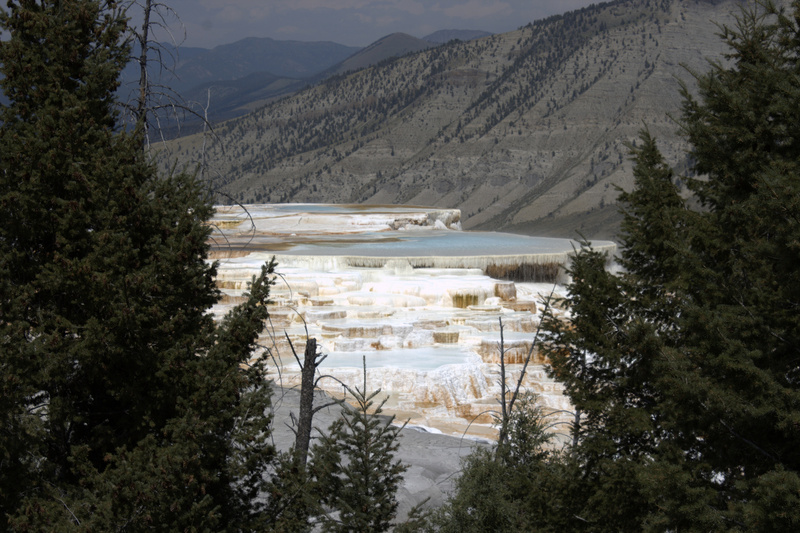 The wildlife resided more on the east and north side of the park while the south and west had more geothermal activity. This may have been due to time of year or the amount of tourists. 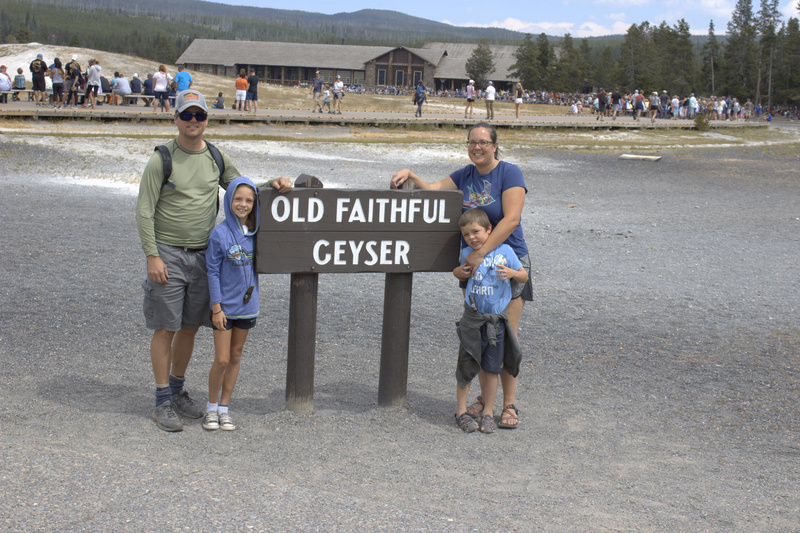 There definitely was more people near the popular sites like Old Faithful and Mammoth Springs. What sets Yellowstone a part from other parks to me is the wildlife and how close you can get to it. Bison and elk often come with in feet of your car or where you're standing. 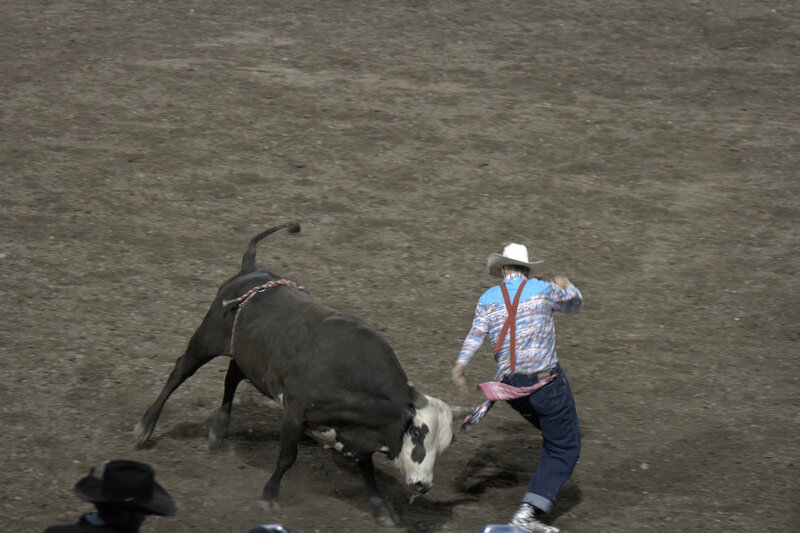 It's easy to forget that these are wild animals that can kill you if they wanted to. The bison dot the distance in Hayden and Lamar Valley. 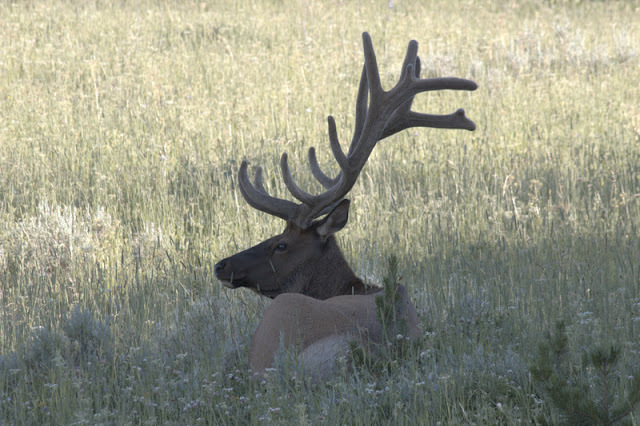 They roam all over the park and the large males walking next to your car will give you butterflies in your stomach. These animals are enormous with heads that seem to cover the expanse of your windshield. Several were ramming each other and fighting for dominance in the heard. It was cool to see but a little unnerving. Antelope seemed to use the bison as protection and would run in the middle of the herds. 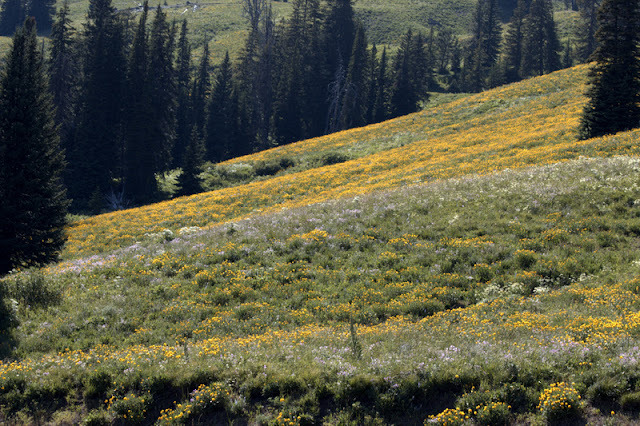 Wildflowers were displaying in the mountain passes and all of the vegetation and trees looked very healthy. Whenever you see people stopped on the side of the road you know it's most likely because some kind of wildlife is there. Usually it's an elk or bison but sometimes you get lucky and see a bear. 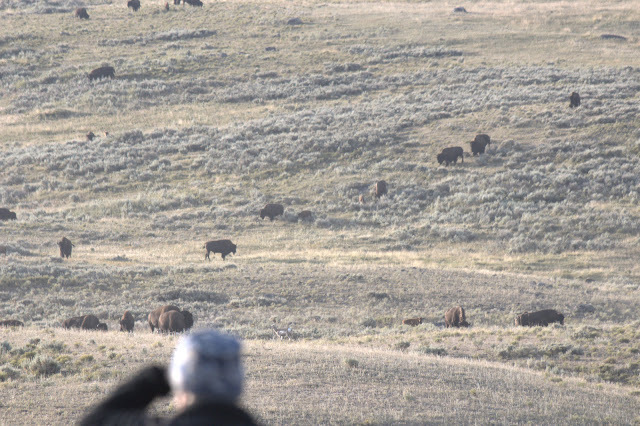 We saw bear and wolves on this trip but they were so far away they could only be seen with binoculars. The treat for me was seeing some river otters. They were where Otter Creek met the Yellowstone River. I figured that creek was just named that way and didn't expect to actually see an otter. 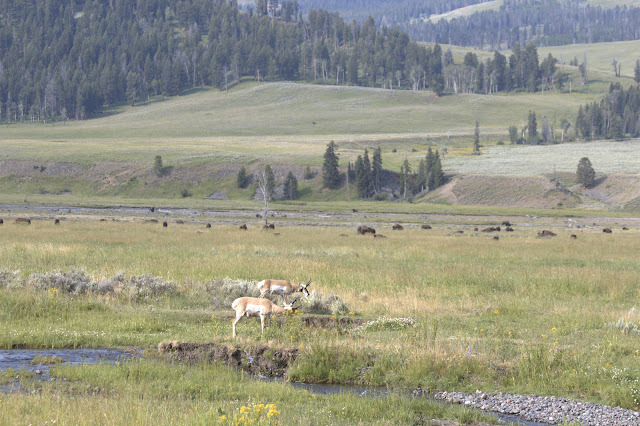 I could have spent my whole time in Lamar or Hayden Valley just watching the wildlife. 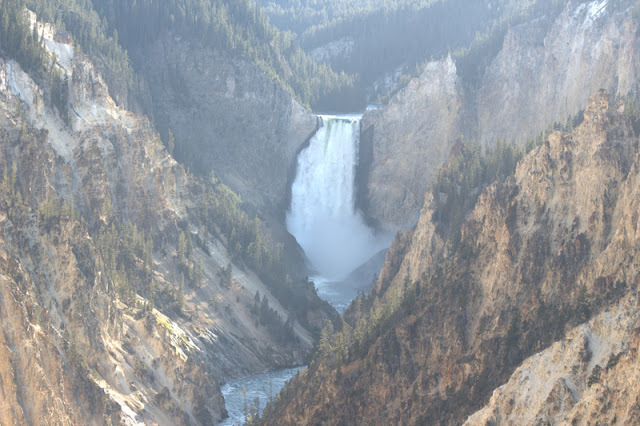 To me that is what the main attraction of Yellowstone is. 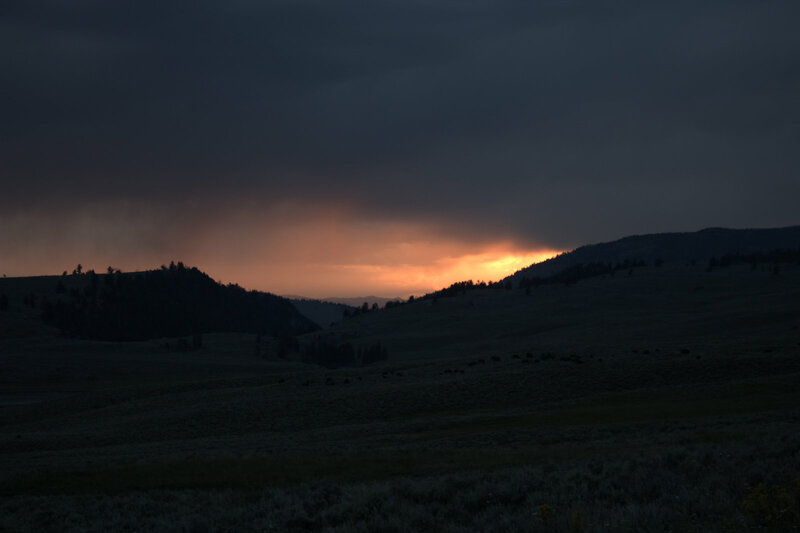 I know that's my own opinion and some people love the geysers but what's great about the valleys is they aren't that crowded and you feel like you're more in a wild setting. I think that's what keeps some people away. They think it's too dangerous and prefer the safe feeling and amenities of what the Old Faithful and Mammoth Springs villages provide. If you can try to check out Lamar or Hayden Valley at sunset.